Doug brings over a decade worth of experience and knowledge of the outdoors. Doug has been working with children, young adults and adults with varying disabilities most of his life. 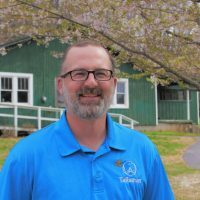 Prior to joining Talisman in 2012, Doug worked eight years at special needs summer camps as a behavior specialist. 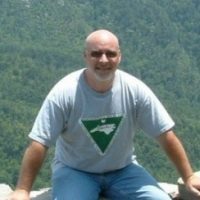 Additionally, Doug was an outdoor education instructor for many years back in Ohio, and continues to guest lecture at several colleges. Wearing many different hats, Doug has also facilitated high & low ropes courses and numerous corporate, communication, teambuilding and leadership workshops. Doug enjoys spending time in the great outdoors, hunting, riding the motorcycle he built and relaxing with his lovely wife Faith and their amazing dog Finnegan. While working as a summer camp counselor as a college student, Linda proclaimed to her director that “I want to be just like you when I grow up!” Little did she know …. 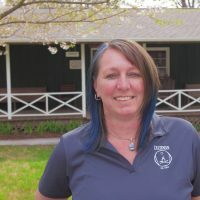 Linda worked at Stone Mountain School from its inception in 1991 to 2000, serving as a counselor, program director, human resources manager and admissions director. Although this was very rewarding, she found the high energy and fun of camp to be her passion. She transitioned to be director of Talisman Programs from 2001 – 2012. Clearly hooked, she is back. Linda is a Red Cross instructor trainer. She thru-hiked the Appalachian Trail in 1990, and still can’t get enough of hiking. In her free time, she gardens, cooks, cycles, runs with her dog and proudly supports her son’s adventures as a second-generation Davidson Wildcat – go ‘Cats! 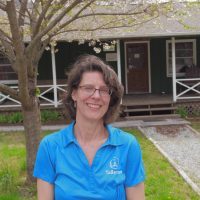 Robiyn’s love for everything summer camp started in the summer of 1998 when she found an amazing way to combine learning, fun and adventure that first fateful summer as director at Talisman. After working several years with Talisman, Robiyn decided to attend graduate school to study clinical and school psychology. Robiyn discovered her passion for understanding and helping those diagnosed with neuro-developmental delays, specifically high-functioning autism. Since then, she has used that experience and understanding to work with families in a variety of settings. Robiyn shares her own adventures with her amazing husband Eddie (also a former Talisman Programs staff)and their demanding cat, Bacon. She can typically be found snowboarding, “Jeeping,” traveling to other countries or generally avoiding housework. Robiyn looks forward to helping you find the perfect special needs summer camp program for your child! Lee is a native of the Hendersonville/Asheville area. Lee comes to Talisman with decades of experience in the manufacturing field. “Being at Talisman is like a breath of fresh air. I enjoy the camp atmosphere and watching the campers have a wonderful summer experience. I have a plethora of experience in the maintenance field, including carpentry, painting and landscaping.” Lee also enjoys camping, backpacking, caving and is an avid mineral collector and rock hound. Lee also enjoys being part of the geocaching community for creating the Tube Torcher geocache and its sequel. Lee happily shares his life with his wife, Sandi, and their two dogs, Ruger and Kimber.